So my big plan for early 2014 is to spend twelve weeks travelling the length of the River Ganges from the source in the Himalayas right the way to Chittagong in the Bay of Bengal, Bangladesh. It will be my third time in India in just four years and for this trip I had made a conscious decision to have a definite start and end point and following the route of the Ganges River presented itself as an obvious choice. The River stretches some 2,500 km across India and intoBangladesh and I’m hoping the route will show the diversity through the country. My plan is to wind up the voyage in Chittagong Bangladesh which is home to the worlds largest ship breaking yard where great ocean going tankers and liners come to end their lives slowly being taken to pieces by hand after being rammed onto the beach. This graveyard where river and ocean going vessels come to end their lives should be a fitting finale after following the course of a river for three months. I’ll be keeping a journal of my voyage here on the blog (wi fi connection permitting) so feel free to drop by to see the progress. You can also follow my progress via Facebook, Instagram and Twitter, just search for the account name ‘denizenreport’ or use the direct links on the ‘Connect’ page of the website. 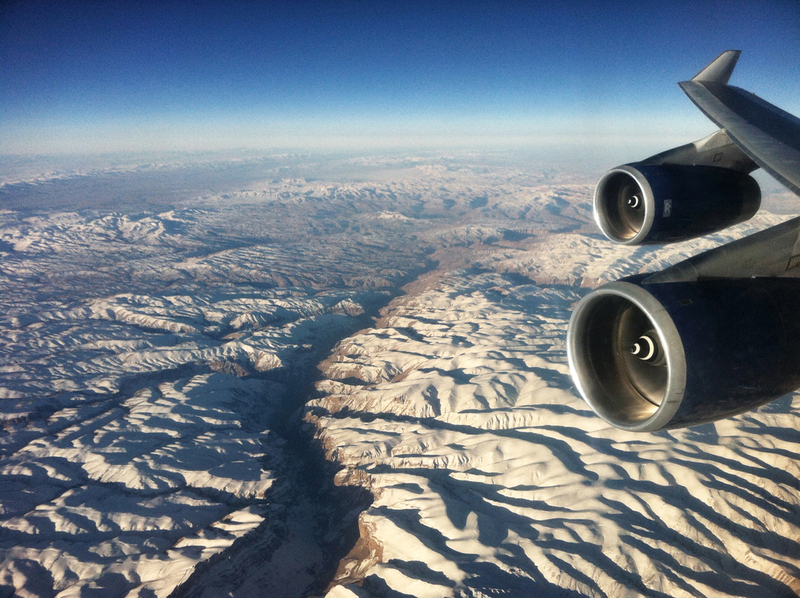 The image above was the first thing I saw in the morning when I lifted the airplane window blind on the overnight flight from London, The Hindu Kush in Afghanistan around three hours before landing in Delhi.